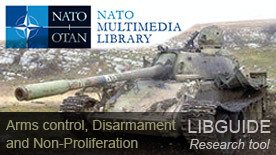 This LibGuide is intended to provide a few starting points to assist you with your research on issues related to arms control, disarmament and non-proliferation, in particular within the NATO context. “NATO seeks its security at the lowest possible level of forces. Arms control, disarmament and non-proliferation contribute to peace, security and stability, and should ensure undiminished security for all Alliance members.” (Strategic Concept 2010 - 19 November 2010). "NATO is committed to arms control, disarmament and non-proliferation, but as long as nuclear weapons exist, it will remain a nuclear alliance." (NATO Topic page on "NATO’s nuclear deterrence policy and forces" - 3 December 2015). "Arms control, disarmament and non-proliferation have been an important aspect of NATO’s agenda since the Cold War. As part of the 1967 Harmel Report on the Future Tasks of the Alliance, NATO Allies formally recognised the importance of negotiations to improve the climate of East-West relations, including talks on disarmament. At the same time, Allies agreed to develop the necessary military capabilities to deter aggression." (2016 Secretary General's Annual Report - 13 March 2017). Report on Options for Confidence and Security Building Measures (CSBMs), Verification, Non-Proliferation, Arms Control and Disarmament: this NATO Arms Control Report was issued as NATO Press Release M-NAC-2(2000)121 on 14 December 2000. NATO Declassified - A Short History of NATO by the NATO Archives service. - the Special Advisory and Consultative Arms Control, Disarmament and Non-Proliferation Committee is a forum for discussion of strategic stability and nuclear transparency. NATO allies agreed to establish such committee at the Chicago Summit in 2012, where the NATO Deterrence and Defence Posture Review (DDPR) was agreed. NATO’s work in relation to arms control and non-proliferation is supported by a number of NATO-accredited national entities. The Joint CBRN Defence Centre of Excellence in Vyškovin the Czech Republic, created in 2006, is one of them. (Source: 2016 Secretary General's Annual Report). In May 1989, NATO adopted a Comprehensive Concept of Arms Control and Disarmament, which allowed the Alliance to move forward in the sphere of arms control. "A State concludes a disarmament treaty and reduces or regulates its armament on the premise that other States would do the same. Thus, the basis of a disarmament treaty can be described as reciprocity." (Source: "Suspension of Certain Obligations of the CFE Treaty by NATO Allies: Examination of the Response to the 2007 Unilateral Treaty Suspension by Russia" by M. Hayashi, in Journal of Conflict and Security Law, vol. 18, no. 1, April 2013). SALT I, the first series of Strategic Arms Limitation Talks, between the United States and the Soviet Union, extended from November 1969 to May 1972 (Source: US Department of State). "Negotiations for a second round of SALT began in late 1972. [...] On June 17, 1979, Carter and Brezhnev signed the SALT II Treaty in Vienna". (Source: US Department of State - Office of the Historian). SALT II never entered into force because of the Soviet intervention in Afghanistan (24 December 1979). The Treaty Between The United States Of America And The Union Of Soviet Socialist Republics On The Elimination Of Their Intermediate-Range And Shorter-Range Missiles (INF Treaty). Signed 8 December 1987. "The Intermediate-Range Nuclear Forces (INF) Treaty at a Glance" by D. Kimball and K. Reif (October 2016). The Treaty on Conventional Armed Forces in Europe (CFE), Signed: 19 November 1990 (Nuclear Threat Initiative website). On 19 November 1999, the Organization for Security and Co-operation in Europe (OSCE) published the Agreement on Adaptation of the Treaty on Conventional Armed Forces in Europe. On 14 July 2007, Russia announced that it would suspend implementation of its Treaty obligations, effective after 150 days. "The Conventional Armed Forces in Europe (CFE) Treaty and the Adapted CFE Treaty at a Glance" by Tom Z. Collina (Arms Control Association), 4 October 2010. The Strategic Arms Reduction Treaty (START I) was signed on 31 July 1991 by U.S. President George H.W. Bush and Soviet President Mikhail Gorbachev. An overview of this Strategic Offensive Reductions (START I) is published on the Nuclear Threat Initiative web site (2011). The START II Treaty, signed on 3 January 1993 never entered into force. See also the US Department of State - Office of The Historian portal: Strategic Arms Limitations Talks/Treaty (SALT) I and II. On 10 September 1996, the UN General Assembly adopted the Comprehensive Nuclear-Test-Ban Treaty. The Congressional Research Service published on 1 September 2016 a backgrounder document: "Comprehensive Nuclear-Test-Ban Treaty: Background and Current Developments". The special edition of The Nonproliferation Review, dedicated to the Comprehensive Nuclear-Test-Ban Treaty (CTBT) - vol. 23, issue 3-4, 2016 includes contributions from prominent scholars and officials including Rose Gottemoeller, Cristian Istrate, Togzhan Kassenova and Tibor Tóth. New Strategic Arms Reduction Treaty (New START), signed in Prague on 8 April 2010. "Nuclear Arms Control in 2013": a presentation by Steven Pifer, that "outlines the New START Treaty, possible next steps on strategic forces, non-strategic nuclear weapons and missile defense issues" (Brookings, July 2013). The Treaty on the Prohibition of Nuclear Weapons adopted on 7 July 2017 (UN Document A/CONF.229/2017/8). NATO Secretary General Jens Stoltenberg, "citing the “current security environment,” said NATO countries had no choice but to maintain their nuclear arsenal." (Source: Politico, 6 Oct 2017). On 13 April 2016, the U.S. Congressional Research Service updated its regular report: "Arms Control and Nonproliferation: A Catalog of Treaties and Agreements". The Arms Control Agreements page (Federation of American Scientists - last update 22 August 2011). An unusual Wall Street Journal op-ed by four distinguished US statesmen — George Shultz, Henry Kissinger, Sam Nunn, and Bill Perry: A World Free of Nuclear Weapons (4 January 2007). "NATO, Arms Control and Nonproliferation: An Alliance Divided?" by Olivier Meier, Arms Control Association (31 March 2009). The NPT Briefing: "Tactical’ Nuclear Weapons: A Dangerous Anachronism", published by the Acronym Institute for Disarmament Diplomacy in 2010. "NATO Revises Nuclear Policy" by Oliver Meier, Arms Control Association (5 December 2010). "Russia-USA Stalemate on Tactical Nuclear Weapons" by Joyce Sabina Lobo, Institute for Defence Studies and Analysis (17 March 2011 ). "NATO Sets Up Arms Control Committee" by Oliver Meier, Arms Control Association (4 April 2011). "NATO, Nuclear Weapons and Arms Control" by Steven Pifer, Arms Control Series, Brookings (July 2011). The NATO Deterrence and Defence Posture Review (DDPR) was agreed at the Chicago Summit in 2012. At this Summit, NATO allies agreed “to establish a committee as a consultative and advisory forum" (the “Special Advisory and Consultative Arms Control, Disarmament and Non-Proliferation Committee”) (20 May 2012). See also NATO Sticks With Nuclear Policy by O. Meier, Arms Control Today (31 May 2012). "The NPT and the Origins of NATO’s Nuclear Sharing Arrangements" by WiIlliam Alberque, IFRI (February 2017). Preventing WMD proliferation: NATO's engagement with its global partners: Speech by NATO Deputy Secretary General Alexander Vershbow at the eleventh annual NATO conference on WMD arms control, disarmament and non-proliferation - Doha, Qatar (2 March 2015). In this speech, Ambassador Vershbow also said that "the [Ukraine] conflict also has a WMD dimension. Russia has stepped up its nuclear exercises and integrated a nuclear component into conventional exercises". In 2015, NATO’s Weapons of Mass Destruction Non-Proliferation Centre (WMDC) celebrated its 15th anniversary, stepping up its activities to respond to the new terrorist threats ("Fighting weapons of terror", NATO News, 4 September 2015). At Warsaw in July 2016, the Alliance set out clear positions on the issues of nuclear deterrence and nuclear disarmament. Allies also reaffirmed their strong support for arms control and their commitment to preserve,strengthen, and modernise conventional arms control in Europe. (Source: The Secretary General 2016 Report). In 2016, the NATO Committee on Proliferation met more than ten times in various formats to discuss WMD/CBRN risks and threats, the implementation of the 2009 NATO comprehensive strategic-level policy on WMD/CBRN and to develop policy guidance for NATO’s responses to proliferation. The Committee also held partner meetings with Finland, Israel and Sweden on WMD proliferation issues and on recent developments in the non-proliferation and nuclear disarmament field in the United Nations (UN) General Assembly framework. (Source:The Secretary General 2016 Report). During 2016, NATO met in the High-Level Task Force on Conventional Arms Control format four times, and 15 times in subordinate committees. These discussions were not always limited to NATO members: in 2016, NATO also consulted partners such as Finland, Georgia and Sweden on arms control matters. (Source:The Secretary General 2016 Report). NATO welcomes 20th anniversary of Chemical Weapons Convention (2 May 2017). On 29 and 30 May 2017, Finland hosted the 13th Annual NATO Conference on WMD Arms Control, Disarmament, and Non-proliferation. Topics of discussion included chemical weapons use in Syria, North Korean nuclear and missile proliferation, and the UN nuclear weapons ban treaty negotiations. (NATO: Finland hosts annual NATO conference on proliferation challenges). In May 2017, NATO Deputy Secretary General Rose Gottemoeller made a visit to Austria with a lectureat the Vienna Centre for Disarmament and Non-Proliferation (VCDNP). Addressing a seminar on ‘NATO’s Enduring Commitment to the Non-Proliferation Treaty’, Ms. Gottemoeller outlined the Alliance’s efforts to preserve peace, limit proliferation and reduce the number of nuclear weapons." (Sources: NATO, 9 May 2017 and ''NATO’s enduring commitment to the Non-Proliferation Treaty'' by NATO Deputy Secretary General Rose Gottemoeller). Countries meeting at a United Nations conference in New York adopted on 7 July 2017 the Treaty on the Prohibition of Nuclear Weapons (UN Document A/CONF.229/2017/8), the first multilateral legally-binding instrument for nuclear disarmament to have been negotiated in 20 years. "As Allies committed to advancing security through deterrence, defence, disarmament, non-proliferation and arms control, we, the Allied nations, cannot support the [Treaty on the Prohibition of Nuclear Weapons ]" stated the North Atlantic Council on 20 September 2017. Estonia hosted Russian arms control inspectors, demonstrating Allies’ ongoing commitment to transparency (NATO Allies host Russian arms control inspectors, 13 March 2018). Since violence broke out in Crimea (beginning of March 2014), the NATO-Russia relations plunged to their lowest point since the end of the Cold War. On 23 June 2014, during the 10th Annual NATO Conference on WMD Arms Control, disarmament and non-proliferation, the NATO Deputy Secretary General Ambassador Vershbow stressed importance of transparency in arms control and disarmament and called the participants to seize the discussions in this forum as an unique opportunity to shape the global non-proliferation and disarmament agendas, and to take them forward. (Source; NATO, 2014). The United States officially charged Russia with violating the INF Treaty in July 2014, when the State Department released the 2014 edition of its report Adherence to and Compliance with Arms Control, Nonproliferation, and Disarmament Agreements and Commitments (the Compliance Report). The tenth Annual NATO Conference on Weapons of Mass Destruction (WMD) Arms Control, Disarmament and Non-proliferation, one of NATO’s largest outreach activities involving Alliance member states and partners from around the world, took place in the Swiss town of Interlaken on 23 and 24 June 2014 (Source; 1 July 2014). On this occasion, NATO Deputy Secretary General Alexander Vershbow expressed some remarks. The NATO Deterrence and Defence Posture Review (DDPR) was agreed at the Chicago Summit in 2012 (20 May 2012).